In 1881, Father Lally was made parish priest of Rahoon. At the time the parish was served by two churches, Bushypark and Barna, Dr McEvilly, Bishop of Galway was appointed as Archbishop of Tuam, and Father Lally was made Vicar Capitular of the Diocese in the interregnum until the appointment of a successor to Dr McEvilly. Dr McEvilly was aware that the very large parish of Rahoon had no central church so he gave Fr Lally money to start the process of erecting a new church beside the Presentation Convent. Fr Lally collected the funds and employed direct labour to build the church. The foundation stone of St Joseph’s was laid on April 22, 1882, and the church was consecrated on February 7, 1886. In January 1893, Fr Lally succeeded in getting a government grant to purchase a premises in Dominick Street for the first technical school in Galway. This is where the Galway Arts Centre is today. Fr Lally was a charismatic man who got things done, so it was no wonder that when the GAA set up street leagues in hurling and football in the early 1950s, the team representing Shantalla would be known as Fr Lally’s. Other teams in the league were St Nicholas’ representing the Claddagh; 98s were from Bohermore; Western Stars were drawn from the Henry Street/West area; St Anthony’s represented Newcastle; Salthill; Renmore; and Na Sáirsealaigh were drawn from the Eyre Square/College Road area. The leagues were played at under-14, under-16, and under-18 levels, competition was fierce, and the games often drew very big crowds. Some of the other teams who played under-14 were St Joseph’s (the industrial school ), Club Muire, and Naomh Pádraic. Many of the participants would go on to represent the county in both football and hurling. 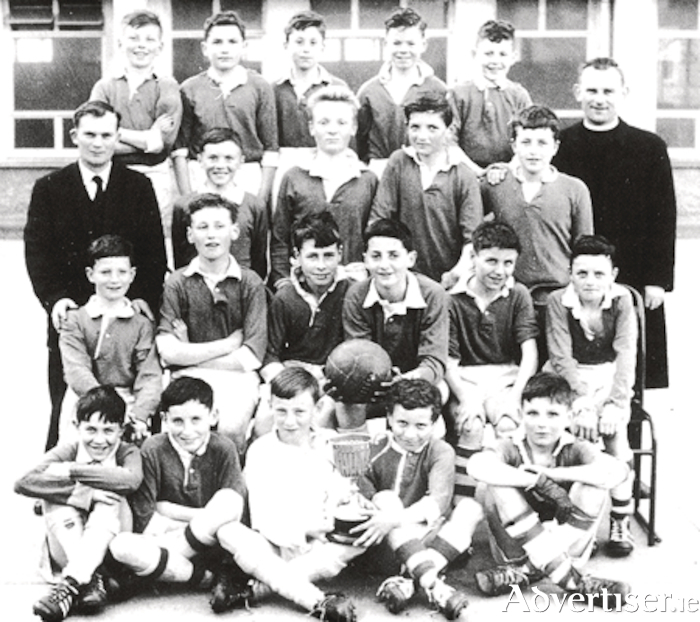 Our photograph today is of the Fr Lally’s team, the under-14 champions of 1965. They are, front row: Joe Trill, Mike Kavanagh, Tony Tighe, Brendan Beatty, and Edwin Rabbitte. In the second row are Ronnie Ward, Christy Wiley, Philip Coyne, Martin Noonan, Mike Beatty, and Dickie Morris. Third row: Pa Boyle, John Joe Connell, Dave Shaughnessy, John Joyce, Joe Corcoran, and Rev Brother James. At the back are Seán Boyle, Seamus Corrigan, Mike Long, Pat Brennan, and Tom Connolly. This is one of the many photographs in the recently published 2018 calendar produced by the Shantalla Residents’ Association to celebrate the 75th anniversary of the building of the housing estate. It is a real community production with a lot of illustrations, old and new, of residents of the area. It is on sale at Tom Nally’s Barber Shop, High Street; E Brún’s, Dominick Street; Londis; The Sliding Rock Pub; and Cooke’s Pub on Newcastle Road. An ideal gift for any ex-Shantalla person living abroad, not to mention those living here too. Cherishing all the children equally?